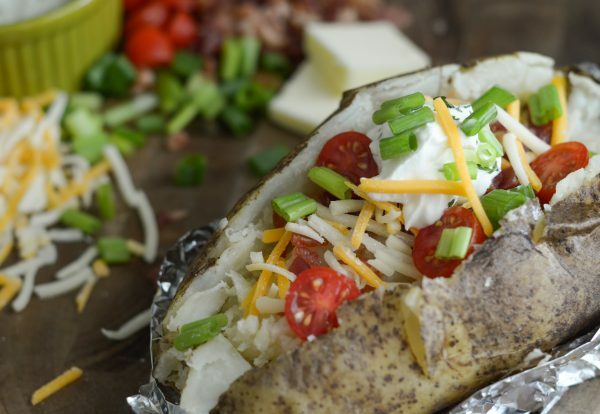 Get ready for the best way to make a baked potato with this Air Fryer Baked Potato Recipe! 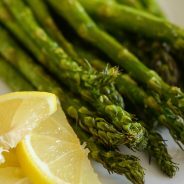 Want more Air Fryer Recipes, be sure to join the Air Fryer Fanatics on Facebook! I think it’s a honest statement to say my air fryer is now used my than my oven or stove. It’s true! If I have a frozen item, like pizza rolls that needs to be cooked in the oven, those go in the air fryer too. I truly feel like everything taste better when made in the Air Fryer. One thing we make regularly in the Air Fryer are Air Fryer Baked Potatoes. We do a baked potato bar at least once a week or every other week. 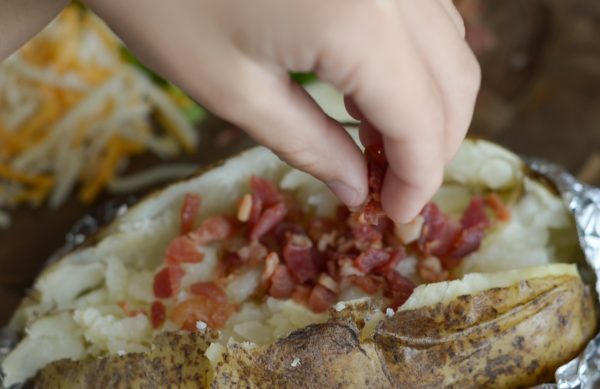 Our son loves baked potatoes, so it’s a great go-to item that everyone can enjoy. I am anxious for chili season so that we can top the potatoes with chili. I have it planned out already that we will do chili one night and the next night, we will have chili topped baked potatoes. Sounds like a plan, doesn’t it? I sure think so! Our Slow Cooker Pumpkin Chili is a regular during the fall on the menu, these baked potatoes will be perfect topped with the leftovers of that chili. 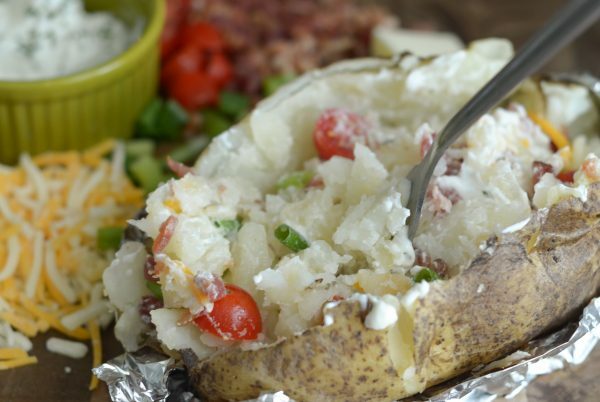 The best part about this Air Fryer Baked Potato Recipe is just how easy it actually is! What do you need for Air Fryer Baked Potatoes? That’s all you need, those few things. 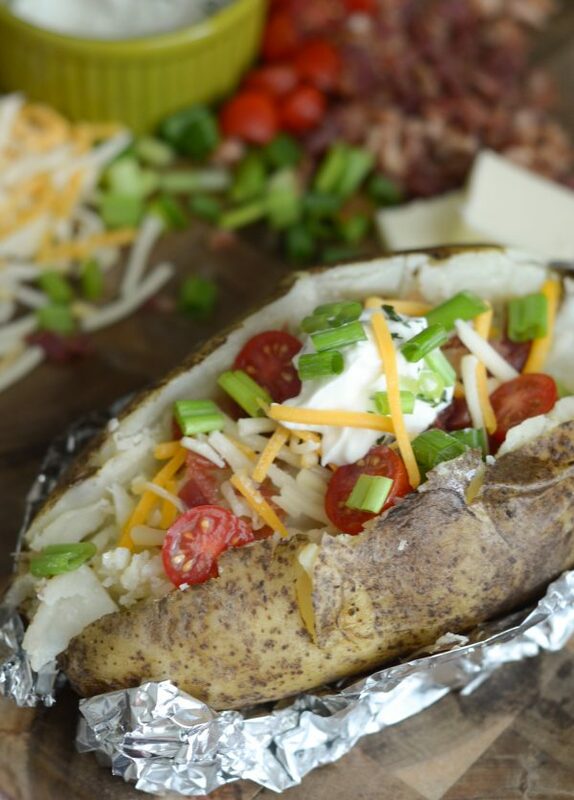 Then, we like to sit out all the toppings for a baked potato bar. 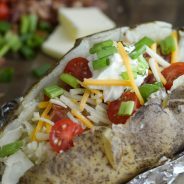 What additional toppings are good for Air Fryer Baked Potatoes? 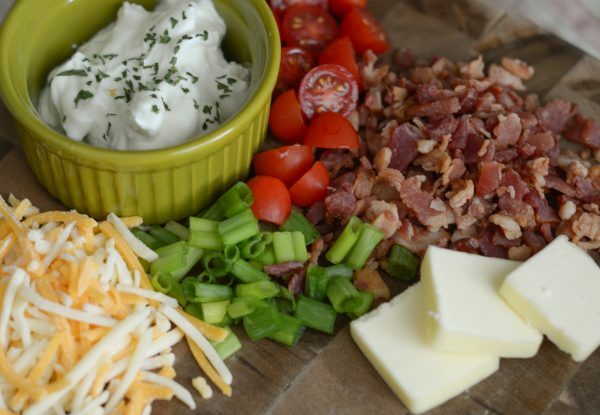 I would say, whichever toppings you LOVE on a baked potato, sit them all out in the center of the table on a nice cutting board or tray. 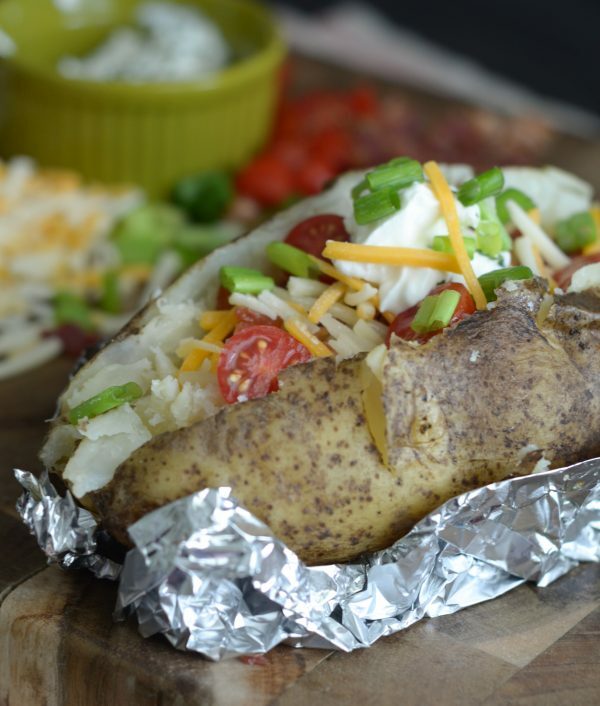 Let the whole family choose what toppings to stuff their baked potato with, that makes it an easy dinner for the entire family. I am very HUGE on having at least a few nights a week where the family gathers around the table. This is a great way to do that without spending hours in the kitchen preparing. 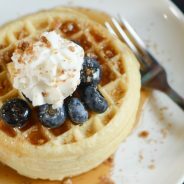 It’s a great thing for many of us moms to spend time in the kitchen, many of us love to cook…BUT it’s also necessary that we also sit down and enjoy time with our family too! 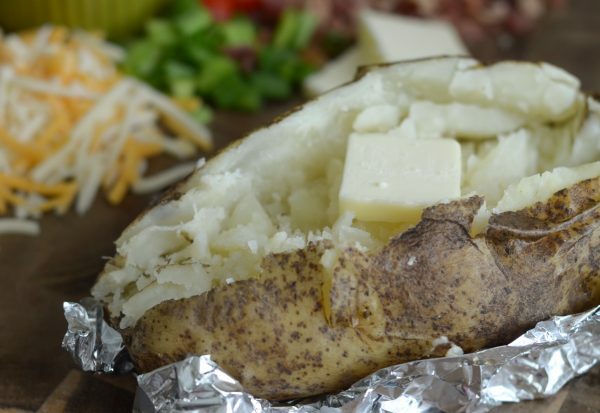 We also love to top our baked potatoes with chopped meats too such as brisket or chicken. These are just perfect for leftover meats as well. 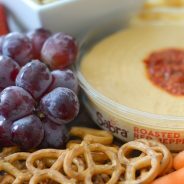 I always think it’s just the perfect way to mix it up and have a meal that really doesn’t taste like leftovers even though you are using them! 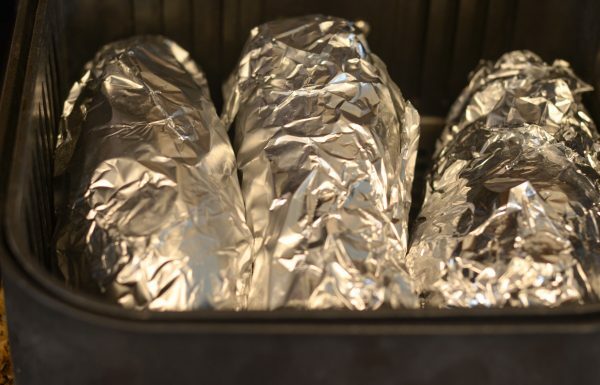 Air Fryer Baked Potatoes, just need to be sprayed with oil, wrapped in foil, and then placed in the air fryer. I cook these on 390* for 40 minutes. Once they are done, they come out perfect and ready for toppings. If you are on the verge of purchase an Air Fryer, be sure to read the How to Choose the Right Air Fryer post before you purchase. My mom just recently purchase this NuWave Air Fryer and she has fallen in love with it too. I have to say, I’ve brought my whole family over to the dark side of the air fryer. I guess I should say the bright side, it makes cooking so much easier. 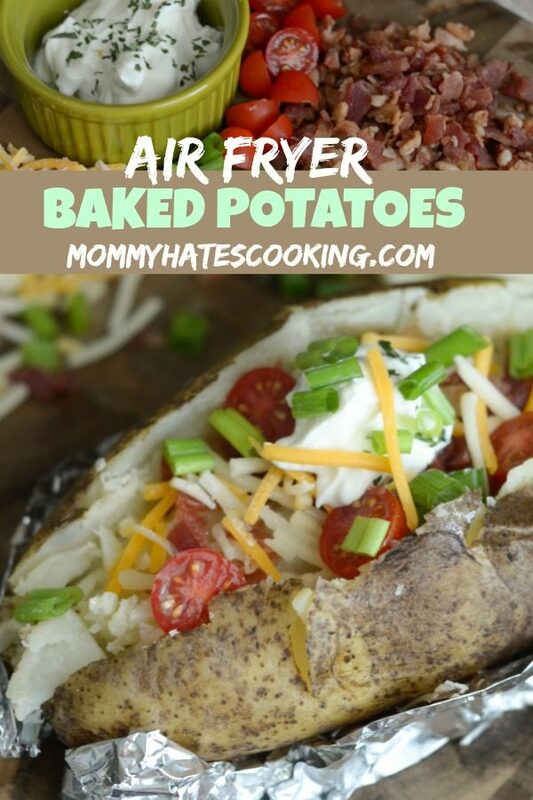 Are you ready for this Air Fryer Baked Potato Recipe, it’s time to make these for dinner! Clean the baked potatoes and evenly coat with cooking spray. Once coated, wrap with foil. Place in the air fryer and cook at 390* for 40 minutes. 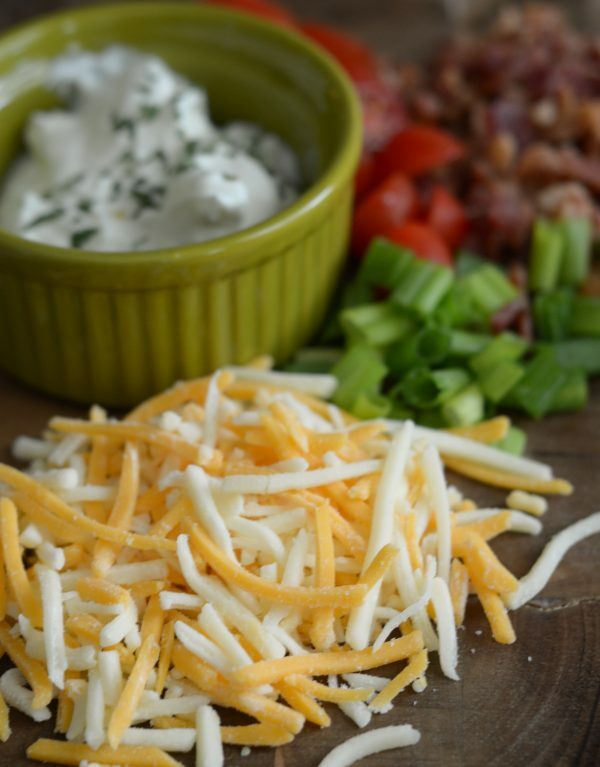 Carefully remove, cut and serve with toppings.